Click any header to expand. Affiliated Family Psychiatry of Wausau, S.C. If there is a behavioral health-based topic for which you would like training and do not see listed, please contact Debi Traeder 715-551-0966 or at traeders@charter.net. A program may be put together to for your needs or another speaker may be available with that expertise. Just as people trained in CPR and the Heimlich Maneuver help save thousands of lives each year, people trained in QPR learn how to recognize the warning signs of a suicide crisis and how to question, persuade, and refer someone to help. Each year thousands of Americans, like you, are saying “Yes” to saving the life of a friend, colleague, sibling, or neighbor. QPR can be learned in our Gatekeeper course in as little as one hour. Gatekeepers can be anyone, but include parents, friends, neighbors, teachers, ministers, doctors, nurses, office supervisors, squad leaders, foremen, police officers, advisors, caseworkers, firefighters, and many others who are strategically positioned to recognize and refer someone at risk of suicide. Presentations can be tailored to specific audiences or the general public. Learn how to be a QPR trainer and provide trainings in your own community. This interactive, content rich, advanced training program is designed for mental health professionals responsible for the care and safety of consumers. As one of only a few registered best practice training programs in this area of clinical practice, the course covers suicide risk detection, assessment interviewing, documentation, and safety management planning and practices for patients across the age span and in any setting; outpatient, inpatient/residential, and emergency. A training that teaches how to help people developing a mental illness or in a crisis. Learn the signs of addiction and mental illnesses; the impact of mental and substance use disorders, an action plan to assess the situation and help, and about the local resources available. Full 8-hour course (can be taught in 2-4 hour sessions or 4-2hour sessions or full day). Materials cost involved. A training for those who work with children that teaches how to help those developing a mental illness or in a crisis. Learn the signs of addiction and mental illnesses; the impact of mental and substance use disorders, an action plan to assess the situation and help, and about the local resources available. Negative childhood experiences are related to major risk factors for the leading causes of illness and death and poor quality of life among adults. ACEs are common among all segments of the population. People who report any ACE are likely to experience adversity in other categories. Learn more about the study and some things we can do to not only help prevent ACEs, but to help those who have gone through such experiences and grow in positives ways. Psychological trauma is a pivotal force that shapes an individual’s mental, emotional, and physical well-being. Because trauma stems from violence, abuse, neglect, disaster, terrorism and war, nearly every family is impacted in some way. Trauma-Informed Care (TIC) provides a new perspective where those providing the support shift from asking “What is wrong with you?” to “What has happened to you?” This change reduces the blame and shame that some people experience when being labeled. It also builds an understanding of how the past impacts the present, which effectively makes the connections that progress toward healing and recovery. TIC takes a collaborative approach, where healing is led by the individual and supported by the service provider. Together, in a true partnership, people learn from each other. There’s greater respect, progress towards healing, and greater efficacy in services. Four-hour to full day training available. An overview of the Zero Suicide Approach to prevention within health and behavioral health settings and how it can and is accomplished. 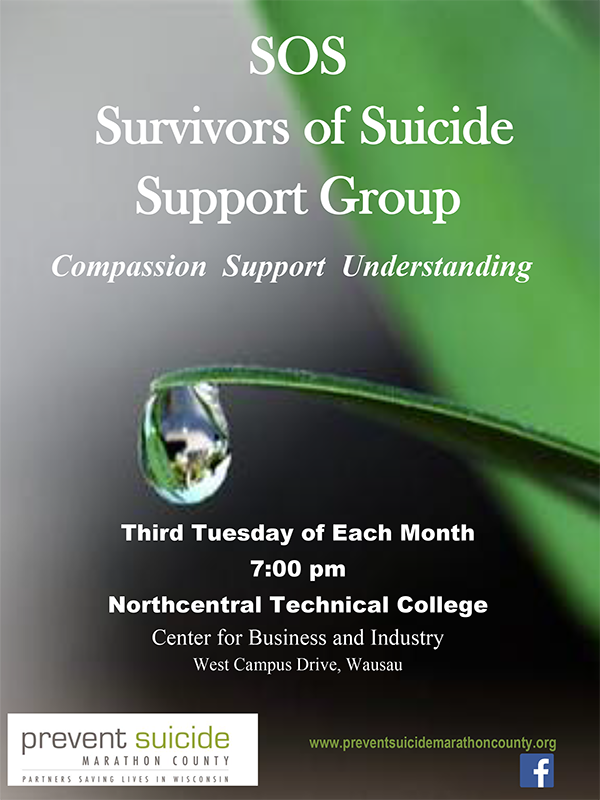 Examples of successful programs are discussed as well as the Wisconsin State Zero Suicide Academy and how to get involved. Methods of stress management that include use of humor to “lighten the load” and ease tension before stress becomes a serious condition. A fun, interactive program. Age-appropriate training for youth, teachers and parents about bullying, warning signs, what to do when it happens, and tools to prevent bullying from happening. An overview of bullying, the prevalence in our area and what we all can do to help prevent and stop it from happening. Bullying does not just happen at school – it can and does continue into the workplace. Discussion about adult and workplace bullying and what can be done to help prevent and stop it from happening. Understanding the emotion of anger and how it can start is the first step to finding ways to deal with it. Learn management and coping skills that may help lead to productive discussions and resolutions. Wisconsin Initiative for Stigma Elimination program. The stigma associated with mental illnesses prevents treatment and impedes recovery. It is fundamental to discrimination in housing, employment, healthcare and insurance reimbursement. Stigma impacts productivity in the workforce and community health. This presentation and facilitated discussion is a great place to start for any group looking to increase inclusion, support and hope for people living with mental health and substance use challenges. General education about depression and other mental illnesses, what they are, and are not; symptoms and treatment. Take a look at the mind/body/soul connection and how they work as one when it comes to healing, and peace of mind. We have things we want to do, accomplish, but for some reason, we just can’t get there. This session talks about setting and achieving goals by developing specific steps, tracking your progress and celebrating your successes along the way. Understand conflict, the good and not so good aspects of conflict and how to handle it in a positive, non-aggressive manner. Program provides a worksheet for self-study. Men, especially those over the age of 40 have the highest rate of suicide in the United States – and men are the least likely to admit to or seek out help. Understand the barriers and what we can all do to help the men in our lives to accept help and not die by suicide. Sometimes we become overwhelmed with all the things we do – and sometimes it’s because we just don’t know how to say “no” to those who ask us to do more. This session talks about setting boundaries and saying “no” in a respectful way. My Client is Suicidal – What Do I Do? Learn about the personal fears and limitation that mental health providers face when dealing with suicidal clients. Understand and recognize the risk factors and warning signs of suicidal ideation and what to do when they manifest with a client/patient. Rural communities face unique challenges when it comes to mental health, including understanding, education and care. This session talks about these barriers and encourages discussion about what can be done to help those in our rural communities. There is a strong link between suicide and substance abuse. By building partnerships in suicide and substance abuse prevention coalitions, services, and communities we can prevent deaths. Discussion about prescription and other drug use and misuse – where they are coming from and what is and can be done to help prevent the continued epidemic of drug abuse in our community. A continuation of Good Drugs Gone Bad, this program includes a 55 minute video and a number of lesson plans for classroom or organization use that include myths and facts, decision making, refusal skills and more. Information about starting, growing and maintaining a community coalition. A lot of organizations and coalitions need to raise funds but have fear and/or inexperience standing in the way. This session talks about the barriers involved with fundraising and looks at ideas and methods for raising funds for an organization. Taking care of others, dealing with crises and adverse outcomes on a daily basis can take a toll on any caregiver. Talk about methods of self-care including debriefing skills, coping skills and when to seek help. Discussion and hands-on application of safety for the caregiver and the client/patient. A series of methodology for providing excellent customer service to clients/patients and to coworkers that include understanding what the customer is really saying, how to react to behaviors and avoiding unproductive conflict and/or reactions. Session subjects and length can vary.